The NJG1122PB4 is a Dual band LNA IC designed for W-CDMA cellular phone of 2.1GHz and 800MHz band.This IC has a LNA pass-through function to select high gain mode or low gain mode.An ultra small and ultra thin package of FFP12B4 is adopted. This is one package pinout of NJG1122PB4,If you need more pinouts please download NJG1122PB4's pdf datasheet. 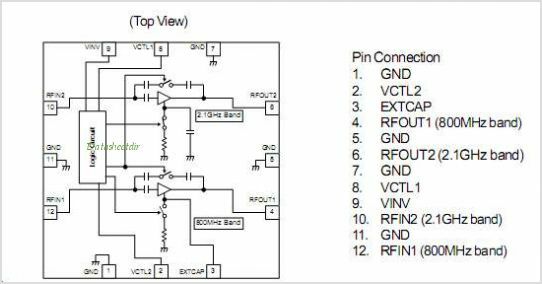 NJG1122PB4 circuits will be updated soon..., now you can download the pdf datasheet to check the circuits!